We continue to welcome the opportunity presented by the review of the RMS, but are underwhelmed by the process and proposals. I wouldn’t belabour the deficiencies of last year’s online survey with 1500 unverified respondents, but for the proposal that the exercise be repeated, with the “Draft Actions” under consideration. I must admit I was initially optimistic when these were previewed, there are sound ideas at heart, but made anodyne, presented with so little detail, as to be vague and inoffensive; anyone could read into them goals we’d like to see achieved. These are “more plans to make plans”, with no palpable improvement, apart from brevity, on the previous RMS. Some essential actions, predicated by legal obligations to designated habitat, have been discarded. All the education actions focus on promoting special qualities, not on shifting emphasis to protection. Establish a Research Station for the Forest – this could provide an evidentiary base for spatial strategy. Habitat Mitigation Framework for the Forest – reliance on Thames Basin Heaths mitigation severely undervalues our more richly featured at-risk habitats, and is not fit for purpose. Strategic Regional Development Forum – working to lower housing targets within and on the borders of the Park to reduce pressure. Bring temporary campsites under a regimen of consistent standards and controls. Create a “Park Ranger” role that includes enforcement. One set of actions that nearly rises to the level of a plan, managing recreation infrastructure, is lumbered with an unrealistic year limit to decide future zoning and control. Rush decisions using whatever data is to hand or can be cobbled together, rather than developing a spatial strategy, with agreed criteria, tied to well grounded evidence, would lead to an infrastructure just as damagingly arbitrary as that which we’ve inherited. It’s well and good to have a set of aspirations, but without a clear set of projects to achieve the least of them, reviewing our aspirations is relegated to a make-work delay in taking action. 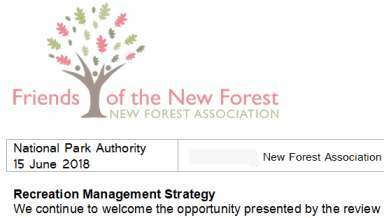 I am confident that you could hammer out useful, practical proposals, that would fulfil the Statutory Purposes of the Park, and legal obligations to designated habitats, commoning, and the working Forest. Please do not let a dumbed-down internet poll be the final word on this important document. half the population of Lyndhurst. In ways that are already being done. This strategy should show how we’ll do things differently to be effective. The obligation under the 2001 SAC Management plan to relocate three FC Campsites (Five year priority 6.4.2 of RMS 2010) should not be ignored; it is even possible that the rash of 28 day license pop-up campsites has effectively absorbed an equal provision already. Error: Error validating access token: Session has expired on Sunday, 10-Mar-19 01:16:56 PST. The current time is Tuesday, 23-Apr-19 11:50:23 PDT.